While-You-Wait Services . . . In addition to the services listed above, we also provide a complete roster of Preventative Maintenance Services recommended by auto manufacturers. 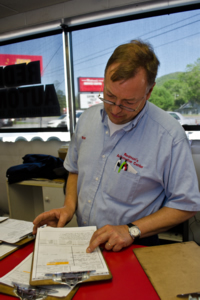 The services listed are designed to keep your car or light truck running well and will ensure long engine life. Redmon's can usually provide these services for less than your dealer charges. Please call if you have questions about your vehicle. For your convenience, we have created a Vehicle Service Form that you can fill out and bring along with your vehicle. By taking a few minutes and completing it, you will help us do our job better. Just click the form name below and you will be able to either print it or download it to your computer. Thank you!